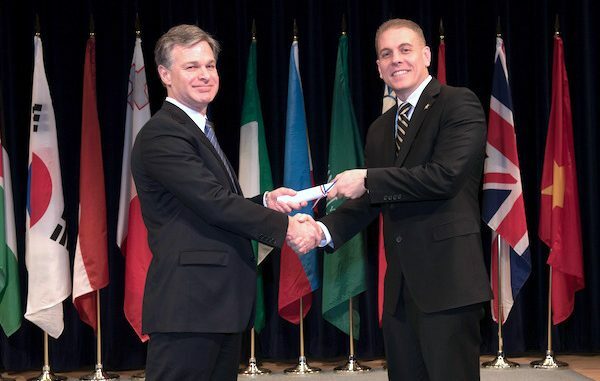 VERO BEACH – Indian River County Sheriff Deryl Loar is proud to announce the graduation of Major Eric Flowers from the 270th Session of the FBI National Academy Program at Quantico, Virginia. In October 2017, two hundred and twenty-two law enforcement officers began the rigorous eleven-week training program. Known for its academic excellence, the National Academy Program, held at the FBI Academy, offers courses in advanced communication, leadership, cybercrime, and fitness for selected law enforcement leaders who have proven records as professionals within their agencies. The 270th Session of the National Academy consisted of men and women from 49 states, the District of Columbia, 20 international countries, three military organizations, and four federal civilian organizations. Training for this program is provided by the FBI Academy instructional staff, Special Agents, and other staff members holding advanced degrees, many of whom are recognized internationally in their fields of expertise. The FBI National Academy began in 1935 as a way to professionalize policing across the country. Since 1972, National Academy students have been able to earn undergraduate and graduate credits from the University of Virginia through the courses offered in the program. “The Indian River County Sheriff’s Office is proud of Major Flowers for this prestigious accomplishment. Less than one-tenth of one percent of all law enforcement officers have the opportunity to attend the FBI National Academy Program. In the 92 year history of the Indian River County Sheriff’s Office, Major Flowers is only the 11th person to represent our agency at the FBI Academy in Quantico,” said Sheriff Deryl Loar.